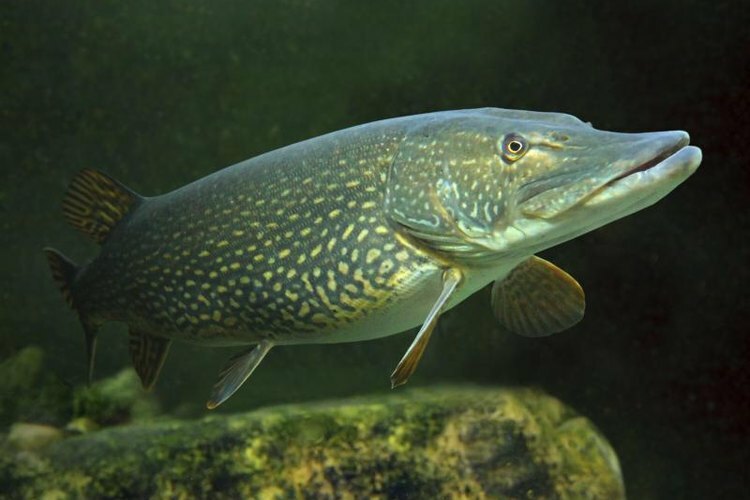 Northern pike coloration features light spots on a dark background. Northern pike share habitat with muskellunge -- often referred to as muskie -- in many lakes and rivers across North America. Similarities between these related fish species can make identification difficult for anglers, but a few key physical characteristics make it simple to tell the difference. In addition to color, several other clues give away the identity of pike and muskie. The paired fins on the lower body of a northern pike are rounded in shape, as is the tail fin. These fins on muskie have more distinct points. Northern pike also have fully scaled cheek plates, while the cheeks of muskie are scaled only on the upper half. Another distinguishing feature can be seen on the underside of the lower jaw; northern pike have fewer than five pores on either side of the jaw, while muskie have six to nine.